Stewards are the first line of defense in protecting employees’ rights in the workplace and ensuring that the collective bargaining agreement is enforced. Below is a comprehensive list of stewards across all worksites. See an error or want to add an email or phone number? Send us an email. Thanks to a United States Supreme Court decision in NLRB v J. Weingarten (1975), an employee has the right to ask for union representation if he or she believes a supervisory meeting could lead to disciplinary action. These rights are known as “Weingarten Rights” and stewards serve as union representatives. 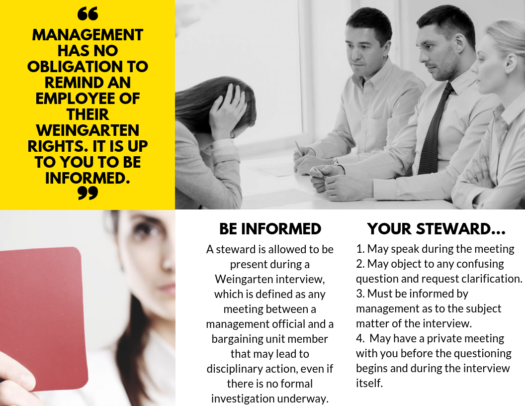 A steward is allowed to be present during a Weingarten interview, which is defined as any meeting between a management official and a bargaining unit member that may lead to disciplinary action even if there is no formal investigation underway. As a steward, you must inform and educate your members about these rights. It is important for them to understand and remember these rights. Management has no obligation to remind an employee of their Weingarten rights. If an employee does not ask for union representation, they are essentially waiving their right to it. In regard to investigatory interviews, employers often assert that the only role of union representatives is to observe and, if the representative chooses, take notes. This is not true. The union representative must be allowed to advise and assist the employee. Below is an explanation of these duties along with a list of possible scenarios to offer further guidance on an employee’s Weingarten Rights. Note: Weingarten Rights do not apply during a supervisory review of the employee’s work. The supervisor or manager must inform the steward of the subject matter of the interview – they must disclose the type of misconduct or violation being investigated. The steward must be allowed to have a private meeting with the employee before questioning begins. It also may be possible to “caucus” for private meetings during the interview. The steward may speak during the interview, but cannot end the interview. The steward may object to a confusing question and may request clarification of the question. It is important that the employee understands what is being asked. The steward cannot advise the employee to refuse to answer questions. However, the steward can advise the employee not to answer questions that are abusive, misleading, badgering, or harassing. When the questioning ends, the steward can choose to provide management with information explaining or justifying the employee’s conduct. Always discuss this possibility with the employee before the meeting. During a meeting with her supervisor, an employee suddenly feels as though she is being investigated. At that point she asks for her steward. Is it too late? An employee can request union representation at any point during the meeting. The request must be granted if the employee has a reasonable belief that the meeting could lead to discipline. You see an employee being questioned in a supervisor’s office. Can you ask to be admitted? Yes. A steward has the right to insist on admission to a meeting which appears to be a Weingarten interview. If the employee does not want you there, caucus with them and explain why they should have you there. However, the final choice is the employee’s. An employee requests union representation and is told, “I was going to try to keep this between us, but now that you’ve asked for the union, I have to call the personnel director and you’ll be in deeper trouble.” Is this allowed? No. The employee is being coerced into waiving their rights. This is an Unfair Labor Practice and may also be a grievable offense. Management asks an employee to submit to a sobriety test. Does Weingarten apply? Yes. If requested, the employee must be allowed to consult with the union first. A supervisor calls an employee at home to ask questions. Does Weingarten apply? Yes. An employee, who reasonably believes discipline may result, can refuse to answer questions until they are properly represented by a union steward. An employee insists on consulting with a private attorney before being subjected to an investigatory meeting? They do not have this right. Under Weingarten, they are only guaranteed the presence of a union representative. Management tells an employee they must use a particular steward? The choice of steward is generally up to the employee, as long as more than one steward is reasonably available. A steward is being questioned? 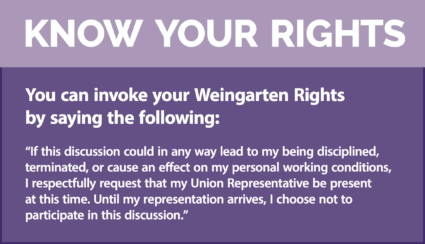 Union stewards also have Weingarten Rights. They can request the presence of another steward. An employee asks for a union steward in an investigatory meeting, and management refuses? The employee can refuse to answer questions, but must sit through whatever meeting management wants to have. However, the employee may be taking a risk that management will discipline them for refusing to answer. It may be the best option for the employee to protest, but answer questions under protest only, and grieve the whole thing later. This choice will vary from case to case. They should take lots of notes, and point out to management that they are violating the law and the CBA. Immediately after the meeting they should contact their union steward. An employee refuses to answer questions in an investigatory meeting, even with a union steward there? That employee could be disciplined for it. You should tell them ahead of time not to refuse to answer legitimate questions, but also not to volunteer additional information. An employee is called in to the office to inform on other employees? That person arguably could be able to invoke Weingarten, because they could potentially be disciplined if they refuse to provide the information management is seeking. However, law in New Hampshire is uncertain in this regard. Management generally has the right to conduct, investigate, and obtain relevant information from employees who themselves are not being disciplined, without those employees being able to assert Weingarten rights. What if the employer asks a question pertaining to a potential violation of criminal law? If a public employer is asking about criminal misconduct, then you may have a Garrity Rights situation. In that case, the employee does have the right to refuse to answer a question under the 5th Amendment of the U.S. Constitution. The employee should only answer questions if he/she is expressly told that the investigation is administrative only, and failure to answer the question will result in termination. If that occurs, any statements made by the employee could not be held against him/her in subsequent criminal proceedings. If a Garrity situation arises, contact the SEA office immediately, as an attorney may need to assist the member. Only attorneys are privileged to hear a member’s criminal confession without becoming a witness that might later be called in subsequent criminal proceedings.